What makes a selfie so fascinating to look at? Among many things, a selfie is a statement: a constructed image designed by its subject to present his or herself in their own desired way. The way they would most like to be seen (or think they should be seen). The most typical kind of selfie is tied to notions of sexual attraction. But not always. Until recently, Swedish artist Pär Strömberg has been best known for his startlingly atmospheric, dreamlike depictions of nature – inspired by the forests, mountains, animals, fairy tales, myths and legends of the place where he grew up. Yet his latest body of work, about to go on show at PAPER, represents a new strand in the artist’s practice. The title of the exhibition, Those of the Unlight, not only relates to this but also references an album by the Swedish black metal band Marduk, which first introduced Strömberg (a lifelong fan himself) to the scene. He recalls the feeling of being an outsider welcomed into “a community of outsiders” (in his words), and connects this with the collectivising action of the #blackmetalgirls. By presenting themselves in this way, each ‘black metal girl’ shines light upon her own ‘outsider’ identity and places herself among a group of others. As such, the piece returns us to a wider set of reflections on the nature of social media – a phenomenon designed around the idea of community-creation, which people use to shape, project and define their own status in relation to others – but also identity and community in a much broader sense. 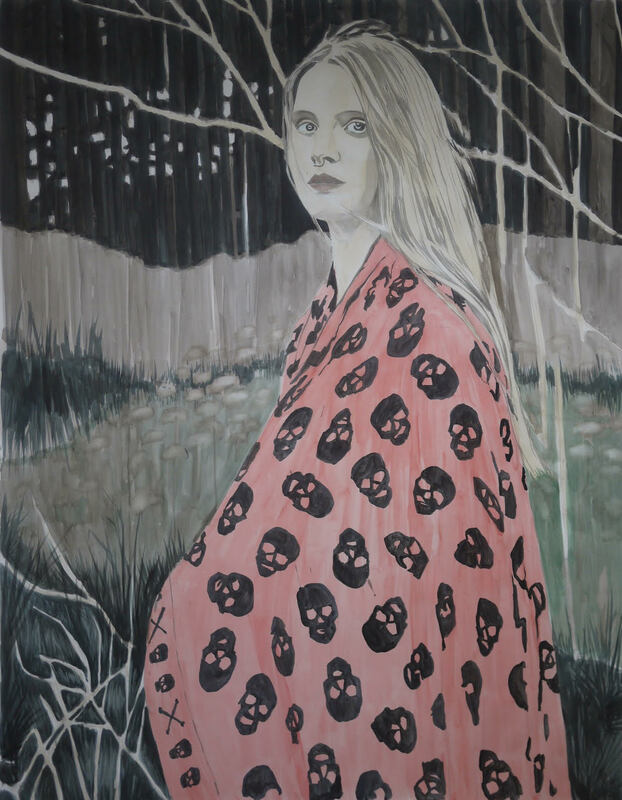 In addition to the Black Metal Girls series, Strömberg will also present several larger works on paper that develop the theme through the restaging of a selection of Pagan and folkloric allegories and icons. These works have a more collaborative aspect to them; the outcome of a series of conversations between him and several of the women who were particularly engaged in the project. Here they take on the role of “strong contemporary martyrs,” as Strömberg describes. Those of the Unlight is an exhibition that raises a number of questions around what it means to try and take control of your own image, and the balance of power behind that act. It will be interesting to see in what direction the PAPER artist’s practice develops in next. Those of the Unlight opens at Paper on 19 August and runs until 30 September 2017.